Finish off your signature burger or fried fish sandwich with this Choice 12 oz. clear squeeze bottle. This bottle's versatile, simple design is ideal for both back-of-house and front-of-house applications. While its open tip eliminates the need to cut off the top, its tight, no-leak cap prevents accidental spills and messes. The lids do not withstand the heavy use. Recommend hand washing them as a commercial dishwasher is too hot and the bottles split at the lid. the lids are stripped very easily and do not last long. These bottles are perfect for sauces. I fill them with our house sauce and have them on the tables. nozzle is wide enough to not get clogged, and bottle opening makes it easy to fill. These come in very handy for dispensing condiments quickly . The clear bottles are great for quickly identifying their contents. The price is very reasonable for the quality of the product. These hold a lot. These were nice to use. Not too hard to clean according to my son. The bottles do not come with caps so you will need to purchase separately. We are sorry you did not receive caps with your order. A Customer Solutions Representative will reach out to you shortly! The price can't be beat! And these squeeze bottles can be used for so many things- salad dressing, olive oil, mayonnaise, mustard, syrup, and more! The hole in the cap is the perfect size. Easy to clean! A workhorse for so many different needs. Great quality. The lIds fit well and no leakage from cap area. Wil definitely be buying these again. These squeeze bottles work great. The seal is strong and the contents do not blowout the sides when using. We prefer the wide mouth sizes since they are easier to fill. I use these in my coffee shop for drizzling syrup over drinks. They are durable, easy to squeeze, and easy to clean. Funnel part is small enough that I can even make pretty designs on top of lattes. The pack of siz 12 oz. Clear Squeeze Bottles are great for dispensing oil and sauces. The 12 ounce size is good for slower moving product. Great value for this condiment squeeze bottle. Good size, easy to clean. Cap easy to remove and wash and fits nice and snug on the bottle. I love these squeeze bottles. they are great for persision squeezing. they store well and are great for catering. the only down side is that they are slightly difficult to clean. These are great for making your own homemade BBQ sauce, ketchup, salad dressings, even shampoo! I love these for my own kitchen and I see much potential for using all 6. These clear squeeze bottles are the perfect size for storing sauces or condiments. I bought this specifically for storing honey. In the past, it was a constant struggle battling those honey dippers and my honey jars always ended up a sticky mess. Please note these particular bottles do not have the small cap to seal off the top. I simply cover the top with a small piece of plastic wrap when storing these bottles. These are nice quality squeeze bottles perfect for bar, restaurant, café or home use. Each bottle includes a twist on cap and is easy to squeeze and dispense. These squeeze bottles are legit. Great for holding sauces and easy to clean. We use them at all of our locations. We recommend to anyone for sure. bottle is a little smaller than we were anticipating but it fits exactly what we're looking for, we use it to organize our different "add-ins"
These are great little squirt bottles for making your own sauces. The tips opening is fairly small and thus can't accomodate chunky sauces though. Still a useful bottle. I must have them because all my general sauce like ketchup, mayo, mustard and etc needs them. I can squeeze them easier with these bottles. This product is very easy to use. I filled this with chocolate syrup or strawberry syrup. It pours easy without messing or dripping accured. Washing is easy too just used warm soapy water then rinse. Great quality for the price. I use them for royal frosting while decorating cookies, and my bottles have probably been through the dishwasher 100 times (I make a lot of cookies), and they're still as good as new! These sauce dispensers are great and a have to have if you are a caterer who frequently cooks and drops off food to events. GREAT PRODUCT! These bottles are perfect for putting sauces out at a BBQ. The six pack allows for a variety to be displayed. The tops are a snug fit- no leaks, and the plastic is substantial yet supple enough that you don't have to worry about crack, even after many squeezes. THe perfect squeeze bottle for mayonnaise and other condiments. We keep these ready on our prep table in the kitchen to dispense mayo onto our burgers. Great squeeze bottle here with this product. Perfect for ketchup, bbq sauces, oils, vinegar or any type of condiment needs. Cleans super easy in the sink as well! These clear squeeze bottles are perfect for holding and dispensing honey, agave, and simple syrup if you run a cafe or coffee shop. They are also great for making chocolate sauce designs on top of lattes and mochas. A decent bottle the only complaint is that the construction is so light that some heavy based sauces or condiments may cause the top to come off when squeezing the bottle. The squeeze bottles are multipurpose. We fill them with chocolate and caramel sauces for topping ice cream and with olive oil and savory sauces for cooking and topping sandwiches. Great all-purpose squeeze bottles. The 12oz is a handy size. The tops are easy to cut if you need a bigger hole for thicker liquids. Great price too! The 12 oz. Clear Squeeze Bottle works great for my buttery popcorn topping. It is easy to dispense and just the right size. I highly recommend this bottle and would purchase again if needed. These bottles are a great deal for the price. They work for all but the thickest sauces. Be careful not to fill with anything over approximately 140 degrees. The plastic gets soft and makes me concerned for their integrity at these temperatures. I would recommend. These bottles are perfect for oil & vinegar, balsamic dressings, regular oil, and even some liquid soaps. I have used these multiple ways in my kitchen and also household cleaning. I like these squeeze bottles. Sturdier than I thought they were going to be. I use them for caramel and fudge sauces. Easy to warm up product with warm water. The only think I regret is that there is no tip covering on these. I have to apply plastic wrap if I want to store these for later. These are very easy to fill, we use them to refill our salt and pepper shakers. the tip is just the right size for pouring control. Nice sturdy plastic squeeze bottles, I used them for my daughter's paint party and it worked like a charm. The bottles were very easy to fill and the cap closed nice and tight with no leaking. You can't go wrong with these. We use them both in the kitchen and the bar of our pub. They've been holding up well, don't leak, and are easy to clean. Works great for the price. Wish it had the little cap but we just stick a piece of aluminum foil under the lid for storage. The squeeze bottles are perfect for dressing salad's in a visually appealing and artistic manner. I also like using them for vinegar and olive oil at the dinner table for barbecues during the summer . These squeeze bottles are perfect for sprinkles, nerds, syrups, peanut butter, Nutella. They are also super easy to clean. We will definitely be purchasing more of these bottles in the future. I use this squeeze bottle for serving honey to customers. The hole size works well with honey consistency. I only needed one but they're sold in packs of six. At least this way when it gets funky I can just toss it and start a new one. These are made of good quality plastic. We melt chocolates in these bottles and use them for decorating. Throw them in the microwave or leave them in bottle warmers with no issues. I love these for salad dressings for caterings - they work perfectly. Great size, durability and quality. Some bottles will leak out if you squeeze hard - these are well made and won't leak! I bought these so I can have smaller amounts of oil by my stove for when I need oil. They are sturdy and hold enough oil for small batches of cooking. yay for bottles! things for ketchup, bbq sauce, mustard or even olive oil, red wine vinegarette, I use for ranch primarily and started using it for simple syrup and agave! These are perfect for our BBQ sauce! They are also perfect to use for many other condiments when catering. They are sturdy and a great value! My restaurant was needing more speed bottles and this low cost option was the perfect solution. The work great and with the cost being low, cutting the nozzles for chunkier condiments doesn't bother me. These squeeze bottles hold a lot of product. They are,great for condiments and even some sauces. They store nicely in fridge and don't take up much space. Finally! A decent squeeze bottle that lasts and the top does not pop off during use and easy to clean. I love these 12oz. squeeze bottles! Love these bottles. They hold the test of time and are great for condiments, salad dressings and more. We did have to snip the tip slightly on a few for the thicker liquids. But overall a great purchase. We love these squeeze bottles for mainly condiments like ketchup and sauces. They are inexpensive but high in quality. A must have and I recommend! These bottles are very nice. They are very flexible but you can really tell that they are a better grade plastic. Heavier and thicker than some others I have, they made a great addition to my supplies. Would buy again! These are great for marinade sauces used on stove in a pan or even Worcestershire sauce on the grill! This was a great idea at an even better price! This 12 ounce squeeze bottle is awesome! It's great for so many condiments especially if you buy the gallon. Instead of having gallons all over kitchen you can just use the 12 ounce bottle! I love these squeeze bottles, they are indispensable for multiple sauces for a nice finished plated dessert or for salad dressing options. The top screws on well, so you never have to worry about accident spills. I've noticed a lot of people commenting on the lack of cap, which can be an issue. I've found the Tablecraft 4 and 2 oz squeeze bottle caps are compatible. These squeeze bottles are great. I wish they had a cap, but they are nice quality. I use them for chocolate ganache, simple syrup, and milk soaks. Great squeeze bottles, i use for ranch and ketchup, and gunpowder for my muzzle-loading musket. Many uses and great price on the bottles, whole 6 pack. The price is reasonable. Good squeeze bottle. I use them for sauce or oil. Used for a while but never had any issues. Good item. Holy cow! these have been used a lot for the past 5 months and i love them, i didnt think they would last as long because of the cheap price but they do! i use them to keep oil and different liquids i use for the griddle. Great quality and price! These work great for distributing my BBQ sauce. When I have a bulk order I use these bottles. My stickers adhere to them nicely and they seal up great. Also best prices I've found anywhere. Perfect container for more commonly used liquids. I use mine to store different cooking oils so I can easily add them to pans and cooking surfaces. I have also found these bottles to be dishwasher safe in a residential dishwasher. I do wish they had some sort of cap or lid. Great size, sturdy, the lids stay on while dispensing. Perfect for bbq sauces, dressings and other condiments. They take up less room than the original bottles condiments come in. We send these out with our party trays. Sometimes we get them returned and sometimes we don't but they are relatively inexpensive so we just charge a few $$$ extra for the party tray to cover the cost in case they aren't returned. Quality squeeze bottles. The top fits snugly and I have no fear of anything leaking when using it. I put cooking oil in one so I have it readily available by my side. These don't come with caps but that shouldn't be problem for most things you might fill these with. 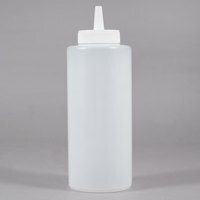 We purchased a lot of these squeeze bottles and use them all the time for salad dressings and sauces. We cut the tops on a few of them to use them for thicker sauces, but they work very well and clean easily in the dishwasher. I use squeeze bottles for my royal icing while I am decorating cookies. I couldn't resist the price for these bottle! I love the lid because it is solid and produces a nice even flow of my icing. The bottle is easy to squeeze and easy to clean. These squeeze bottles are very inexpensive, I have had to cut the tip off to make it bigger even for barbecue sauce. But great buy. I use these to put condiments on the tae at home, I try to dress up the table like we're eating our since we can't always afford to go out, currently full of barbecue sauce! We use these for seriously everything. No matter how many I have I always find myself needing more, and at this price point that is okay. We use them for oils, sauces, cooking wines, soap--anything you can think of. These are great for sauces and they clean very easily. I think they are better than the ones I got from the dollar store, in that they are more durable and feel a little stronger. Be careful to strain out pieces because the slim spout will get clogged with anything that has pieces or is thick. Nice 12oz squeeze bottle. We use many of them for different dressings in the restaurant. Weather its ranch or olive oil they are perfect. Great 6 pk price. We love these for so many things! Salad dressings, Olive Oil, sauces, wine for cooking and sop much more! Very handy and held up great! So easy to use and so many uses. I have used for hot fudge sauce, melted chocolate, pancake batter, and many more. Its good quality too. We use these clear bottles for snow cone syrup and they work great! Kid's can easily use the bottles and they clean up well after use. Great for condiments, but also amazing for dressings and sauces, thick or thin -- just strain out any loose herbs or chunks -- easy for plating, dressing, or even writing/decorating. These are the best. Note: for watery sauces, use bottles with narrower lid openings. 12 oz. Clear Squeeze Bottle - 6 / Pack Super easy squeeze bottle. can customize opening - super easy to clean - looks great on counter. Good product that performs as expected. The only thing I’ve noticed is that over time, you can get some discoloration in the plastic with darker sauces, bbq, etc but that is to be expected. I am not sure how much one can say about a plastic squeeze bottle but these do what they were meant to do without any issue. These things are perfect for the price., I use the squeeze bottles for storing sauces, syrups, and many other things. They work great at dispensing honey cleanly. I plan to purchase more in the future. These bottles work exactly as expected. No bad smell. Only thing is there is no cap; it has a lid (with the squeeze part) but no cap, so if you want to keep it entirely sealed you must buy them separate. Overall a great product! As a test I squeezed water out of the 12 oz. - 6 / Pack Clear Squeeze Bottle. I saw by the way I squeeze the bottle determines how much liquid will actually come out. Good to know I still have some control. I love mixing my own salad dressings and this squeeze bottles are perfect. I also use them to make pancakes in different shapes, kids and adults alike love the detail. I am currently using one of them to marinate sprigs of rosemary in olive oil. Whenever I need to use the oil, it will be super practical to squeeze the bottle and drizzle. These are fantastic bottles with a disposable price. I've yet to wear one out but when I do, the price is so good that I won't cry about having to toss it and grab a new one. My favorite thing to store in these is my cooking oils. It's so easy to get exactly the amount that I need. The only con is that the tip is just a little too fine for chunkier sauces (like unstrained hot sauce) but I cut the tip off a bit with the serrated blade on my Leatherman since I didn't want to dull a serrated kitchen knife. These things are perfect for the price. I use them for oils and salad dressings, great to distribute dressing without having to toss a salad forever to distribute. My little creative use is to use one for dish soap, then I just buy the soap in bulk and refill as needed. I use the squeeze bottles for storing sauces, syrups, and many other things. They work great at dispensing honey cleanly. I plan to purchase more in the future. These are nice squeeze bottles. The 12 oz. size of the bottle works well with my fridge space and the price is very affordable. I recommend it. What can you say about this product that hasn't already been said. Great product, great price, great service. There has to be 100's of uses for these things, and that's just in the kitchen. Indispensable. this squeeze bottle 6 pack is perfect for different sauces and dressing for your line, cap is sturdy and easy to clean, price is the best part! Great price and great squeeze bottles. We use them for our chocolate syrups. We have been using our set for quite some time and they are still in great shape. I was hoping to use this for our caesar dressing. It isn't a super thick dressing, but it still had a hard time coming out of the cap. We cut down the cap and it still wasn't really wanting to come out, so we are using it for white wine for sauteeing instead. The bottles are a decent quality for the price and pack size, I just wish they had worked for our purpose. I like these. But I wish the tip was a bit wider. After reading reviews, I thought I would be able to cut the tip down a bit to allow thicker batters to move through. I was wrong, the plastic is super thick. I bought them for a cinco de mayo taco bar and could only use one for the sour cream. I haven't used them since, but I refuse to throw them away. I will probably use them for caramel sauce when making cupcakes or something. These squeeze bottles are great! The mouth of the bottles are big enough that the bottles are easy to clean and the size is perfect for so many things! A solid brand of squirt bottle. Always need more of these guys and these ones never leak on me. I only wish I had ordered more. Great size containers to put homemade hot sauce in. I like to make homemade sauces but the larger bottles are not the best for hot sauce but these smaller ones work great. Also a great price. cannot be beat. Great for putting sauces inside, nice and clear but these do stain overtime. I'm not sure how long these will hold up but they are so cheap that it won't be an issue to replace. We use these for our warm sauces. My major complaint is that after using for a while, they tend to split at the seams and leak. We fill these bottles with olive oil to use in conjunction with our panini press. A small drizzle on the press and a small drizzle on the bread. This size is ideal if you are entertaining since it is the same size as store bought ketchup and mustard type squeeze bottles, user friendly. We use one for olive oil and keep a green colored frilly club toothpick in the opening to identify the contents and also keep it semi- lidded (in a decorative way). No drips, it is a quality nozzle. I do not think you can have too many of these squeeze bottles. We use them for the different toppings we use for platescaping our desserts. The kitchen loves how functional they are. They are easy to clean. They come in a pack of 6 - which we use all of. Well worth the money. We use these on our tables and have gone through A LOT of them. We generally have to cut the ends of the tips on the lids off -- the spout is so fine that even a tiny piece of onion in our sauce clogs up the whole thing. After heavy use with a red BBQ sauce, they do discolor and turn a dark yellowish color over time. These are small for commercial use unless you plan to use them for sauces not used a lot. They are better for intermittent use. If they stain, they're cheap enough to replace easily and without too much concern. Very pleased with my order on the squeeze bottles for our home! Great price that no one can beat! I ordered 3 sets! Super fast shipping! Arrived in time for Christmas! Could not be more pleased with everything in our order! Pretty good quality but a little small for heavy usage. More for a dessert sauce or something that requires lesser amounts per usage. Otherwise it will require a refill fairly often. Good squeeze bottle for liquid sauces. May not be the best for thicker sauces because the opening in the tip is small. If there are solid particles in the sauce there is a chance the tip gets clogged. Thank you for your review! For thicker sauces, you can use this 12 oz. Clear Squeeze Bottle. It features a wide mouth opening which will work better at dispensing anything with solid particles in it. These are awesome for BBQ or Hot Sauce or even for Mayo. You can even use them for Ketchup and Mustard but I prefer the colored bottles for that. These are well made and perfect size for handling by adults and kids. Not too large or too small. We use these for all of our bbq sauces and they have worked well. The lids are very small though and you have to make sure that nothing will obstruct them. otherwise perfect product! Love these bottles. I like them better than others because their short and easier for kids to hold. You can't find this size in stores so make sure you order enough here for replacements if needed. Easy to clean too. These squeeze bottles are as versatile as they come. Weather used in diners, residential kitchens, bakeries or restaurants they are a must in any kitchen. Easy to use and even easier to clean I highly recommend this squeeze bottle. Add condiments, sauces, glazes, chocolate and more! These are good for average use. The opening is a little small. Good for salad dressings, and liquid products. I wouldnt recomend for thicker sauces. These are great for holding items like mayo, bbq sauce, oils, etc these are easily refillable and clean up fairly easy with some hot water, a must have! These squeeze bottles have endured many rounds of washing and squeezing and still are functioning like new. They are a great product and price is good, too! I love these! A great value for the money. I use these for customers to help themselves to condiments for hot dogs and sausages. I run a mobile hot dog cart and these make my job so much easier, they clean easily too! Very convenient and easy to refill. we use them on a daily basis for all types of sauces. we even fill them with salt and pepper to refill shakers easier. Some of the fancier and bigger named coffee houses uses these to dispense Caramel sauce on Frappuccinos, ketchup dispensers, etc. We use it for our barista bar dispensing of sauces, and syrups. I use this for my special sauce because its clear. I can now set these bottles on the tables so people can use as much as they prefer. These squeeze bottles are perfect for plating time and they are great for accurately saucing dishes. They are easy to wash and last as long as the tops don't get lost. Don't use them as storage containers they will stain. these 12 oz bottles are perfect for small scale production. I was originally worried about the size being too small, but they are easy to fill quickly and I would rather refill more often than have wasted product. They are easy to squeeze and most fluids run down the sides nicely. Note to home chefs--if you are considering buying this product, buy it. There are two things you can never have enough of in your kitchen--towels, and squeeze bottle. These do the job, are cheap enough to replace as needed, and make cooking/laying out any dishes involving liquids that much easier. I make my own dressing and this container is handy for shaking it up and for putting it on whatever I am eating. I amke the dressing and store it in these in the refrigerator. Perfect size clear squeeze bottle for sauces or behind the bar. They clean easily and will last a good long time. We use our's daily. In addition to oils and sauces, always keep one filled with water in case I need to create a bit of steam. My favorite feature is that they are slightly shorter and have a larger diameter than our old bottles. This small difference makes them significantly more stable. These have been used for all sorts of things in our restaurant since purchasing them and they have held up very well. Many runs through the dishwasher with no issues. I would buy these again. I use these bottles daily for quick access to extracts & vinegar and they work great - I would purchase more and recommend them to anyone! we use two dozen of these sconstantly in our 6:30as to 8:00 resturant. They hold up very well and are easy to clean and sanatize. Great price. Everyone tries to take them. The tops do not pop off like the cheap ones. No lids but they are still better that those cheaper looking ones. They are very easy to clean too. These work great for our deli area. My workers often throw them in the sink and then throw pans on top of, which I discourage, and they break. However for getting months and months of use out of such a low priced bottle. who can complain?!?! Great buy and will be buying these as long as my business is open!! I love the 12 oz size. I keep oil in mine next to the stove for easy access to oil when frying something. I also use them when decorating baked goods. Great product! Makes drizzling caramel on my cupcakes so much easier and with much less mess! Good price value for 6 bottles in an order. These bottles are great because they are economical and can be used for a multitude of condiments and ingredients. We use ours to store vanilla in for easy measurement while baking. These squeeze bottles are very handy around the kitchen for all kinds of sauces. Mayo, Dressing, Pestos all much easier squeesed then spooned on. The top is very small and usually needs to be cut to make larger. We use The 12 oz Clear Bottle's for refelling our salt and pepper shakers, But They can be used for so many different things like ketchup,mustard mayo ect. Awesome little bottles to have around, we sue them for just about everything, the clear bottle makes it easy to see contents, these are the perfect size for dressing, toppings, condiments and more. These are good multi-use little bottles. They are cheap, but get the job done. We use them for dressings, sauces, and even out front with for the espresso drinks. Great product to have around the pastry kitchen. This fits a great amount of sauce to easally plate desserts or use to portion out oils. These are perfect to use for oil and/or water bottles for my flat top grill. Easy to clean and the cost was less than my local supply store. These are nice! I use these for everything that I want control over from ketchup to balsamic to raspberry syrup! Great for presentation and just keeping condiments fresh and handy! Awesome item to have in your kitchen. Used them for extra BBQ sauce and extra coleslaw sauce at a party. The would be really nice for candy making too. I love these for piping sauces and finishing plates. The tip does not let liquid pour out, like some other bottles, but a gentle squeeze gives good control. Great for use with placing sauces on your food.We were having trouble being consistent with all of our plate decorations looking the same. Using these bottles makes it a snap. This six pack of squeeze bottles is a good value, and they are well made. I gave them 4 stars because I wish they came with little caps. These clear squeeze bottles are super handy. We use them for other sauces in the kitchen, like soy sauce or vinegars, and you can squeeze them right into the pans. These bottles are very handy, and a great value for the price. I have had a couple that leaked around the threads, but only slightly. it is one of the best squeeze bottle for great value. It is very durable and not leaking on top. I definitely buy more and highly recommend. I use these for thickened dyes and they are great. Most squeeze bottles sold for dyeing seem to leak out of the cap when the bottle is inverted and squeezed. These don't. These squeeze bottles are perfect, even for the most upscale of restaurants - you can put nearly any sauce into them and make nice designs on plates or just use for dressings to fill up cups or put on salads quickly. Extremely great price, as usual. this product is great for condimints, hair coloring, making candy and much more. You can reuse or simply wash them out and reuse. I buy this alot. These bottles are a great value for the money. I would have given them a 5 star rating if they would have included caps for the tips. These bottles are used in our kitchen for sauces and decorating cookies and other bakery goods. They make the task much easier and storage of sauces and icing is easy. perfect for my chocolate, caramel and white chocolate syrups. These bottles allow my baristas to create beautiful drinks consistently without using more syrup than needed.